I received the new Knit Picks catalogue, and noticed that every question that came to mind as I flipped through it could be answered with a yes. Does this sweater make the model look fat? Yes. Is this garment poorly blocked? Yes. Are those buttons sloppily placed? Yes. Is it possible to have too many cables on a sweater? Oh, yeah. Would that sock pattern look really nice with some beads on it? Yes! Do I really need more knitting books? Um, yes, but not today, thanks. Are these needles as pretty, great to work with, and affordable as everyone says? Yes, yes, yes! How About Some Beads On That? So as I was knitting away on the Blue Blob, I had a sudden thought. “Beads. Perhaps some beads would look good on this.” I’d had a good experience with the beads on the Perdita cuff, and the idea didn’t seem impossible. I bought a small packet of variegated irredescent blue beads at the knitting store to see how the color looked, and knitted a bit of a sample to figure out where to place them. I decided that knitting them at the tops of the YO holes in the Old Shale edging would make a nice effect, and found a bunch more similar beads for a whole lot less at Alexander’s Bead Bazaar, so mixed them all up in a flat lidded container. Rather than string them all onto the yarn and slide them into place, I decided to use the wire technique, a variation on the crochet hook technique. I don’t happen to have a crochet hook that small. It may be a faster method, and I’ll give it a try sometime. I did have some Tigertail bead stringing wire, so I cut about a 6 inch length and crimped it hard near the center, making a V shape. then put a bead onto the wire and slid it down into the stitch. and knitted the next stitch. Only 479 more beads to go! Not that I’m counting, or anything. I finally sprung for a set of blocking wires, JoAnn’s having thoughtfully emailed me a 40% off coupon. These are the best! Apparently, you can get the same effect by using welding wire stock, but this set was inexpensive enough, came with a handful of T-pins, a ruler, and a handy storage tube, so it works for me. To illustrate the true marvelousness of proper blocking, here’s a picture of my first lace project, a Branching Out scarf in a pleasant wool yarn — which means I forget what it was. I had washed it, squeezed it dry, then pinned it in sections to my ironing board and held the hot iron over it for bit, which is a simple and quick blocking technique that had been recommended to me when I was incredulous that one would possibly be willing to pin a whole scarf out on the carpet or some such place. But I’ve traveled a ways down the road of madness lace since then, and can totally see cordoning off a room to let a large pinned-out lace object dry in peace. So when my blocking wires arrived, I knew what the perfect test case would be. A wire is visible along the right hand edge, and when the time comes I’ll thread it much more rigorously along the sides. But it’s coming along nicely, and is recognizably a Seascape Shawl. Whew! I finished more knitting projects than I have could have imagined, and have . . . err . . . a few more in the works, thanks to the inspiration I find in reading other folks’ blogs. Thank you for making my day every time I check my blog stats and see that, yes, people are actually reading this thing, on purpose even. Thank you for commenting, writing your blogs, and being creative in so many ways and sharing it with the world. 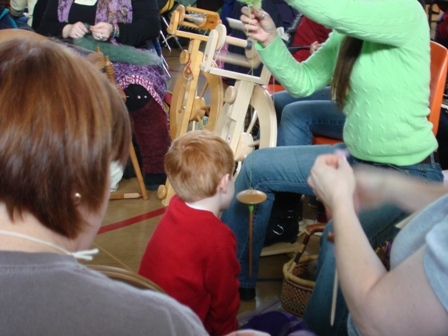 The St. Distaff’s Day Spin-In was a great success! This event was so well-attended that late arrivals couldn’t find space to set up their wheels, and they are looking for a larger venue. This wheel was amazing! There are dried flowers embedded in plastic on wheel, and also butterflies and bees. 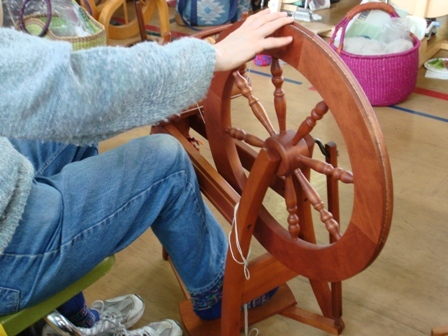 It is a Betty Roberts wheel and her work has quite a following, deservedly so. There is even a Yahoo group dedicated to them. I did well enough with my yarn sales to treat myself to a couple of purchases. 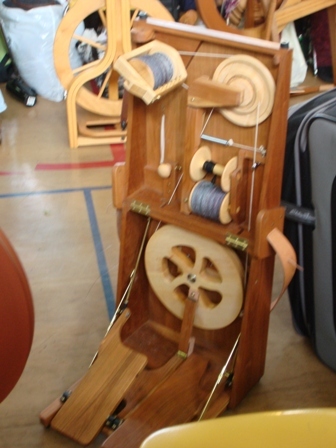 This niddy noddy is perhaps the prettiest niddy noddy in the world, certainly in my house, since I did not have one at all. It’s handmade, and was in the booth next to mine. I saw it from across the tables, and thought, “Oh, my! That must be ast least $70, being handcarved from some lovely wood, and all.” Turns out it was $20, and came into the dealer’s hands with a bunch of stuff that came along with a used loom. She didn’t know any more about it. It’s had some adventures in its life, and has a blotch of ink here and some spots where the finish has worn off there, but it’s light-weight and lovely to use. I put it to work right away holding the yarn I plied. Oh, my. Locally produced cashmere from her own herd of goats. 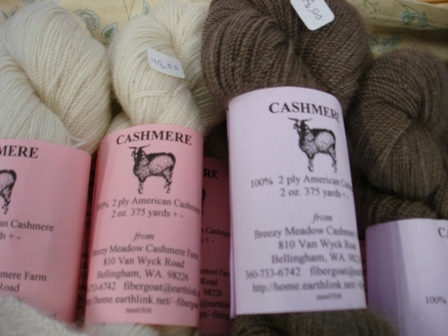 Breezy Meadow Cashmere Farm is in Bellingham, Washington, and sells fiber, yarn, animals, soap, chickens, and eggs. They don’t have an formal internet shop for the fiber products, but if you email them (link on their website), I would hope they’d be happy to sell by mail. Roberta explained to me some of the problems of getting cashmere processed into yarn, and her insistance on high quality work from any mill she deals with. I feel that this is a product that is truly outstanding, and would recommend whole-heartedly. Not cheap, but then I wouldn’t want it to be. Softer than a bunny’s ear, softer than a baby’s cheek, or a kitten’s tail, or anything else you can think of.